The makers say the autonomous robot will carry out local deliveries and do so in the space of 5 – 30 minutes. MOST OF THE focus surrounding robot deliveries tend to focus on drones, but a new company from some former Skype founders are taking a different approach. Its solution is a small, self-driving robot which can deliver groceries locally. The company behind it, Starship Technology, was founded by two of Skype’s co-founders, Ahti Heinla and Janus Friis, and aims to change how local deliveries are conducted. The self-driving autonomous robot drives on the pavement and travels at a speed of 6.4 kph, giving it time to react to any obstacles, and can complete deliveries within five to thirty minutes. While it’s capable of navigating through an area – detecting obstacles, adjusting its speed and knowing when to cross the street – the robots are monitored by human operators who can take control at any time, and communicate with people if necessary. Capable of carrying the equivalent of two grocery bags, the robot is designed for local deliveries that take place within a 5km radius. After choosing a time slot for delivery, those waiting can track the robot’s location using an app and only they can unlock the robot when it arrives. The company claim it will cost ten to fifteen times less than the current cost of local deliveries, and consumes “less energy than a lightbulb”. Pilot services will begin in the US, UK and other countries in 2016. 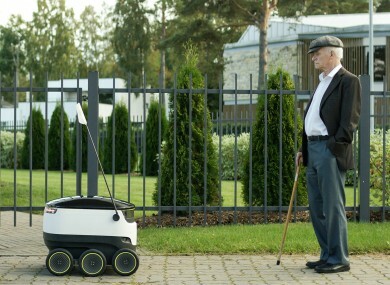 Email “Would you want this small robot to deliver Tayto and Lucozade to you?”. Feedback on “Would you want this small robot to deliver Tayto and Lucozade to you?”.